American singer, actress and model Whitney Houston was one of the greatest and most important female pop stars of all time. Known for her distinctive melodic and virtuosic singing style, she has sold more than 200 million records worldwide. Houston has almost influenced nearly every pop diva that came after her. She is still the most awarded female act in history according to Guinness World Records, with seven consecutive No. 1 Billboard Hot 100 hits and two No. 1 Billboard 200 Album awards. Born on August 9, 1963, in Newark, New Jersey, Whitney followed her family tradition by starting her career in gospel singing. Her first cousins were singers Dionne Warwick and Dee Dee Warwick and Darlene Love was her godmother. Whitney Houston released her self-titled debut album with Arista Records in March 1984 under the supervision of the legendary music industry executive, Clive Davis. Her magical voice and attractive appearance made a killer combination. Houston’s first single, “You Give Good Love”, reached at number 3 on the pop charts. The next single, “Saving All My Love for You”, peaked at number 1 and there was no looking back from there on, as “How Will I Know”, and “Greatest Love of All” also claimed the top spot. Her second album, Whitney, was released in 1987 and became the first album by a female artist to open at number 1 on both the U.S. and the U.K. album charts. It included a duet with her mother, “I Know Him so Well”, and four consecutive number 1 singles, namely “I Want to Dance with Somebody (Who Loves Me),” “Didn’t We Almost Have It All,” “So Emotional,’ and “Where Do Broken Hearts Go”. Houston’s third album, I’m Your Baby Tonight, came out in 1990. Compared to her previous releases, it was a major disappointment. In 1992, Houston starred in the film The Bodyguard, and continued acting in movies into the late 1990s. The movie soundtrack album was a big hit, and her cover of Dolly Parton’s “I Will Always Love You” remained at number 1 for 14 weeks. Houston was found dead in her guest room at The Beverly Hilton, in Beverly Hills, California in February 2012. The official cause of death, according to the coroner’s report, was drowning due to atherosclerotic heart disease and cocaine use. Whitney Houston has been awarded many awards and honors in her remarkable career. A few of them include 22 American Music Awards, 31 Billboard Music Awards, 7 Grammy Awards, 6 People’s Choice Awards and 6 World Music Awards. Houston was inducted into the Songwriters Hall of Fame in 1990. In 2013, she was posthumously inducted into the Grammy Hall of Fame, as well as R&B Hall of Fame. 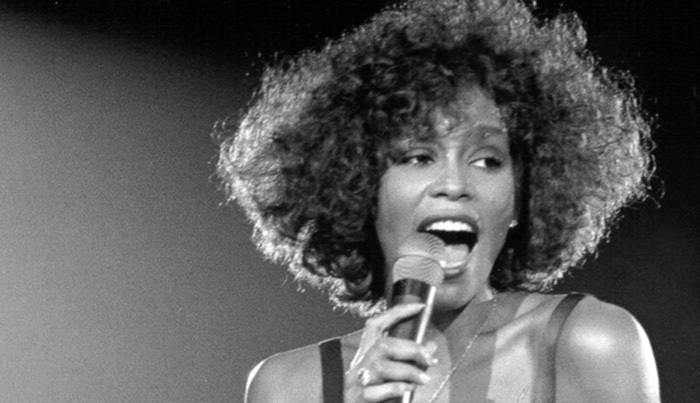 Long known for a turbulent, troubled personal life, Whitney Houston suffered a long battle with drugs and alcohol. At the peak of her career, her behavior was increasingly erratic. Houston also received hate mail and extortion threats. She married R&B singer Bobby Brown in 1992. Houston gave birth to their daughter, Bobbi Kristina Houston Brown, the next year in 1993. The couple filed for divorce in 2006.